Charming pictorial map of Edinburgh that illustrates many sites across the city in profile. This is a c. 1950s Stanley Press pictorial city map or plan of Edinburgh, Scotland. The map depicts the city from the Forth Bridge to the Promenade along the Firth of Forth and from the Firth of Forth to the Royal Observatory and Craigmillar Castle. Wonderfully illustrated in the monumental style, monuments and other important sites throughout Edinburgh and Leith are drawn in profile. Some of the numerous buildings include Edinburgh Castle, the Royal Scottish Academy, the Royal Scottish Museum, and Calton Hill, along with many churches and colleges. Princes Street, one of the main thoroughfares in Edinburgh, is labeled, along with many others. Railways, tramways, and bus routes within the city are also depicted, allowing the tourist the opportunity to use the map to traverse the city and see all the important sites. This map was published by The Stanley Press in the 1950s. Though well represented in institutional collections, this map is scarce on the private market. 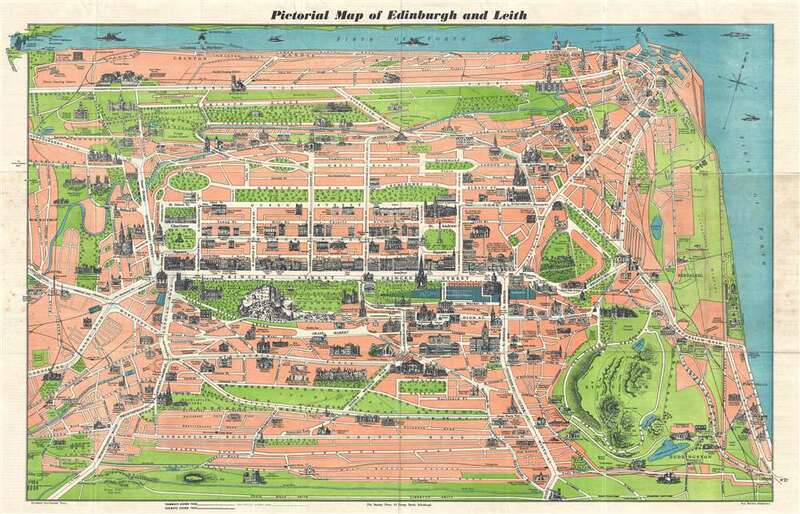 Maps of this style typically illustrate tourist hubs, such as Paris or London, so a map of this genre depicting Edinburgh is not a common discovery. Good. Even overall toning. Some foxing. Verso repairs to fold separations and at fold intersections. Closed tear extending one half inch into printed area professionally repaired on verso. Text on verso.